Source: I received a review copy from the publisher in exchange for an honest review. DEBORAH SCHAUMBERG was born in Brooklyn, not far from where The Tombs takes place. She grew up renovating dilapidated old houses with her family. Her and her father would walk the rooms, floor by floor, making up stories about the inhabitants that were filled with dark secrets, monsters, and, of course, ghosts. 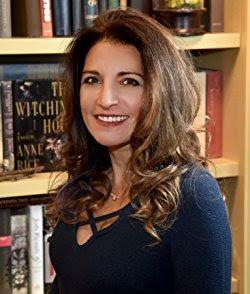 Deborah is a writer and an artist whose work always has an element of fantasy to it, and since she also studied architecture, settings are equally important. It was on a trek to the Annapurna Sanctuary in Nepal that she imagined a girl with the ability to see energy, and the seed of The Tombs was planted. Deborah is a member of the SCBWI, through which she met her agent. She collects old bottles and her favorite holiday is, you guessed it, Halloween. Deborah lives with her family and two dogs in Maryland, just outside DC. The Tombs is a wonderful debut by Deborah Schaumberg, that blends fantasy and history to produce a story that not only showcases fascinating special powers and Gypsies, but also the interesting political and economic climate of New York City in 1882, after the civil war, when the country's turmoil was still evident, due to capitalist greed, continued discrimination and injustice of people of color, immigrants, and low-income people, especially factory workers. Sixteen-year-old Avery is a welder at the ironworks factory and discovers that she is an aura seer, possessing special powers just like her mother, who was taken three years prior by men in crow masks and locked in the Tombs asylum for a supposed mental illness. However, secretive happenings have been going on in the Tombs, including experiments on patients for unknown reasons, so things are not what they seem. And the men in crow masks eventually try to stalk and capture Avery as well as others with special abilities and try to imprison them in the Tombs for their own deceptive purposes. This leads Avery, along with her best friend Khan, to go to the Gypsies for help, in order to rescue her mother from the Tombs, which stands for Temple of Mind Balance Studies. Avery learns more about her abilities from the Gypsies to prepare herself. Also during this time, factory owners are learning how to deal with the threat of labor unions forming and eventually the two storylines blend together into one cohesive story. Inventions were also prominent during this time, so Avery's father's job as an inventor suited the story well. It was interesting to read about his new creations. I also loved how talented Avery was at welding and appreciated the special projects she did as well. Avery also proves to be a very brave and selfless person, based on her actions. I was also fond of Seraphine, Avery's intelligent falcon. I later learned through the author's notes that Peregrine falcons actually nest on top of New York City bridges, so the inclusion made it very realistic. The Tombs itself added an eerie feeling to the story as well as the men with crow masks. The Tombs asylum is located in the basement of a prison, which is old and creepy, with padded rooms and locked doors, nurses with unusual head gear on, odd contraptions used for experimentation in the lab, and a greenhouse for a special, dark purpose. Also, whenever the masked men followed Avery, it created suspenseful moments, and added to the disturbing aura of the story. The historical world building of New York City in 1882 was just spectacular. It was very authentic and the descriptions of that time were well detailed and really made you feel like you were back in that era of airships and horse and carriages, etc. The inclusion of the progress of the Statue of Liberty being built, bridges being built, and inventions of the time really added to the aura of the time period and setting. I also enjoyed how Gypsies had a positive role in the story and were talked about in a good light by helping Avery polish her skills as an aura seer by informing her about her abilities and by making her practice tuning into her second sight to read auras. Also the added bonus of knife throwing practice was interesting! It was also nice how each person's supernatural ability was different and the variety was refreshing in terms of the fantasy element of the story. I just would have liked to see more usage of the supernatural powers in the story. Due to the heavy fantasy and historical nature of the story, the romance isn't the main focus and isn't as prominent as in other stories I've read, but it does include a mild love triangle. The romance that is featured does seem to develop quickly and the love triangle resolves itself just as fast towards the end. I am fine with less romance in a story, as long as the main storyline delivers, which this one does. The pacing of the story is somewhat slow, since the book sits at over 400 pages, but the storyline becomes very thorough as a result, and thus very enjoyable for someone who loves being immersed in the intricate historical details of the story and the engrossing fantasy elements. I particularly treasured this. 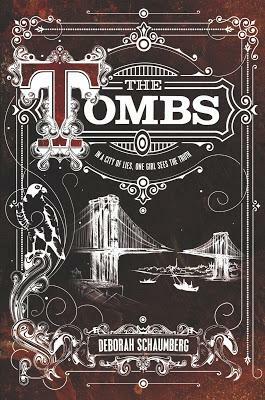 The Tombs brings forth a unique storyline full of adventure and intriguing danger. Full of daring and entrancing characters, interesting supernatural abilities, and a captivating historical setting, this novel is definitely a delight to read. The ending is satisfying and impressive. You won't want to miss out on this debut. The Price Guide To The Occult by Leslye Walton Released Today! !